Welcome to fall in my living room. When we first toured this house, almost fifteen years ago, the stone fireplace and beamed ceiling captured our hearts the minute we walked through the door. The rustic charm of the room is what sold us on this tiny cottage. The space was so warm and cozy, we felt hugged, we knew it was where we wanted to raise our family. We wrote a check that day. Since then, we have added a kitchen and turned the old dining room into a family room. They are great spaces in their own right and, like most families, where we spend most of our time these days. We just don't take advantage of this beautiful room as much as we should anymore. So when my friend Chloe asked me if I wanted to share a fall tablescape, I said sure! Why not? It was the perfect excuse for a romantic dinner for two in front of the fireplace and a chance to enjoy the room. Now, I am a big fan of cottage style and for a long time, I was all about the accessories. However, over the last several years, I have pared down my decor. A few well place pieces is all I need. Clean and simple is the name of my game now. 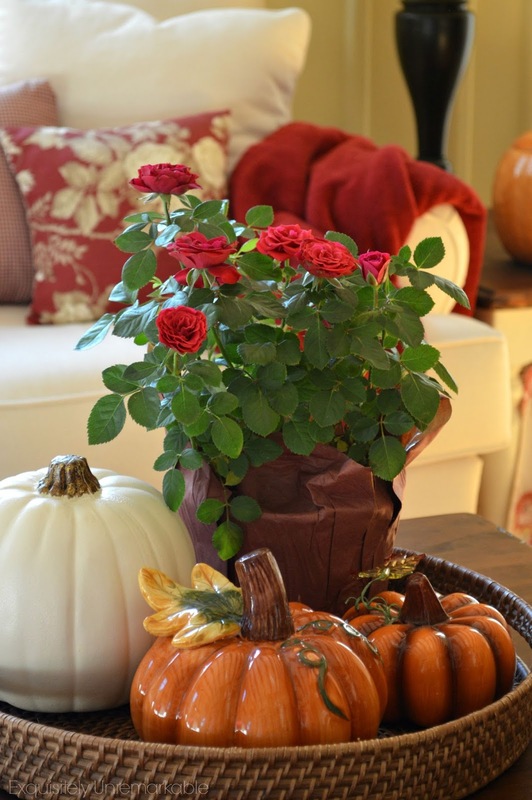 A cookie jar pumpkin vase is takes center stage filled with roses. A pair of woven placemats add a bit of texture to the table and play off the wooden mirror on the mantle and dark beams. The plates are all from Pottery Barn. The red and yellow ones are my everyday dishes. I picked up the pumpkin patch dessert plates last year on a day trip to the country. They are so darn cute, I can't take it. The Gorham Diamond crystal and Spode silverware add a little bit of sparkle and elegance to my otherwise rustic room and I am ready for my date. I mean when a room's this pretty, who can think about food? Here are a few more fall ideas! What a cozy setting for a dinner for two. Your fireplace and wood beam ceiling speaks rustic charm and is the perfect place for a relaxing Fall dinner. 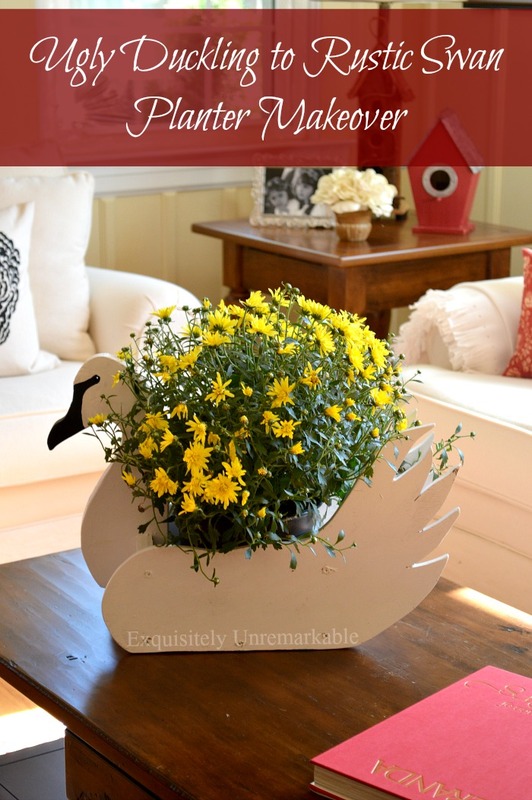 I love the pop of color from the centerpiece pumpkin and yellow mum. It is a setting which could create an opportunity for a long chat and a enjoyable meal at one's leisure. And a glass of wine wouldn't hurt too, don't you agree? Very pretty! That is one beautiful room and I can see why it stole your hearts. You were hugged by this room. Kim, what a simple, relaxing way to enjoy a fall dinner by the fireplace. You've created a cozy setting that fits perfectly in your room's decor. 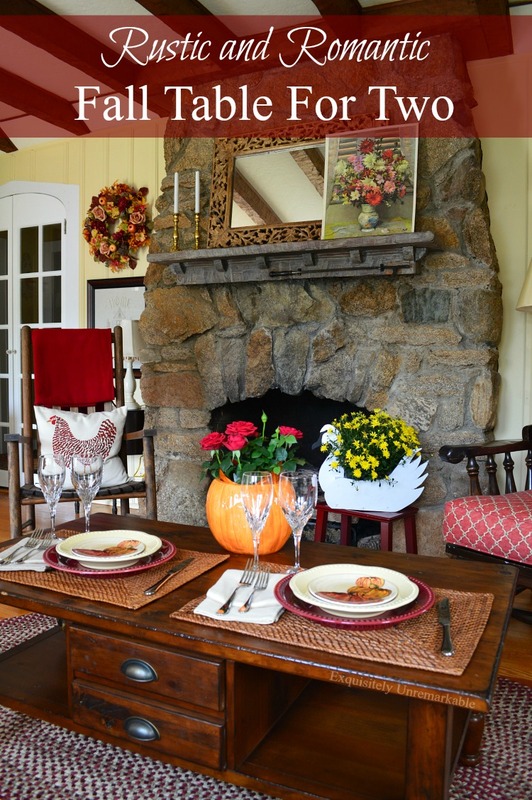 This room looks like the perfect place to spend a Fall evening enjoying a delicious meal by the fireplace. What a pretty tablesetting! I love your pumpkin plates, and I love the orange pumpkin filled with red roses. What a beautiful combination! I can see why you fell in love with this cottage. Those beams and stone fireplace are stunning! Way to go, Kim. Keepin' it real, eating in a living space. I love it! Your fireplace is the best accessory, no need for more. Happy Fall. Hi Rita, thanks!! We're pretty casual around here, so I figured why not. :) Happy fall!! Enjoyed visiting your blog post for autumn. Love those pumpkin plates! Thanks for the inspiration to keep it simple. proof that cozy minimalism is alive and well. Thank you, Christine! You are too kind...and yes, I really do love the fireplace. It's a classic. I can see why you fell in love with that room with that wonderful fireplace. What a lovely setting for a pretty dinner for two! I think I would try and set a lovely dinner for two there once a week! 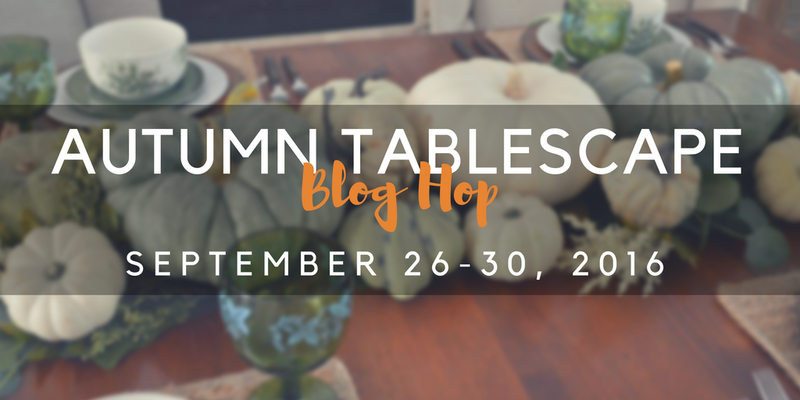 Thank you so much for being a party of the Autumn Tablescape Blog Hop! Haha! That's a great idea, Chloe. I may just try to do that. :) Thank you for hosting the hop. I have had a great time! Hi Kim, I love your beautiful living room and the fireplace is great! You decorated the table for two so nice! I love your pretty plates and the pumpkin with the flowers. I hope you and your husband enjoyed a nice meal together! Have a great day and enjoy the fall weekend. Hi Julie! Thank you so much. It was a lovely evening. I had forgotten how nice it is to just hang out in that room. I also had forgotten how quiet it can be when the kids go out! ;) Ha! The pumpkin plates are just wonderful! I also love the clean simplicity of your styling and the rustic charm of the space. Lovely! Ohhhhh Kim that fireplace is to die for. How beautiful. I have never seen that in your home. What a treasure to have. The romantic dinner in front of that beautiful fireplace is fabulous. I am swooning over this room. So cozy and romantic and inviting. Thanks so much, Karen. Those elements are my favorites, too. Nice and cozy setting. Love it. I really like your fireplace mantle! Thank you, Pepper! It was actually made by the original owner back in the 20's. Nice table. I really should start collecting colored dishes. The salad plates with the pumpkins are so fun. We are getting cool nights so fall is definitely here. Nice to see your fall decorating. Hello Kim, your clean and simple table for two is charming. Love your fireplace and it makes a dramatic backdrop. The pumpkin patch plates are lovely. Kim, your tablescape is charming! I can't figure out how have I never seen your gorgeous fireplace?! I'm smitten! Thank you, Pam! I really do love the room. Have to get in there more often! :) Thanks for the visit! Hi Sheila! We rarely do dinner for two so this was a real treat. Thanks so much for your kind words, Happy October! 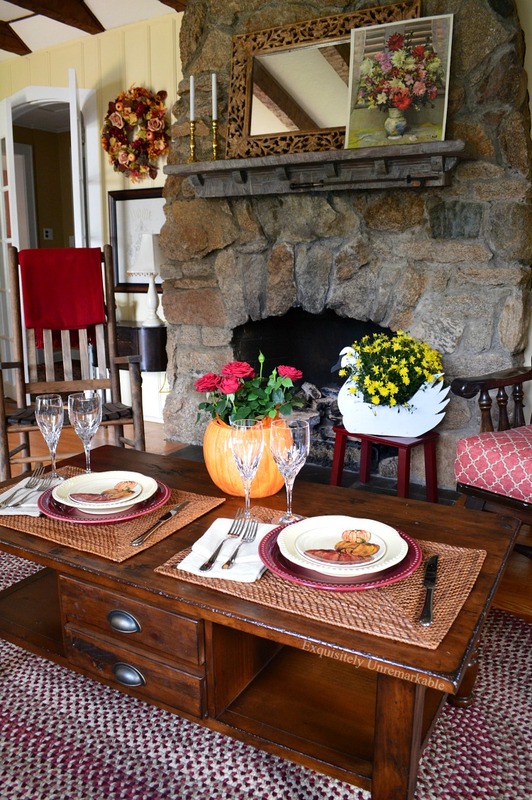 A cozy dinner for two in front of the fire sounds like the perfect recipe to welcome fall no matter what you're eating! I love your pretty pumpkin plates too! 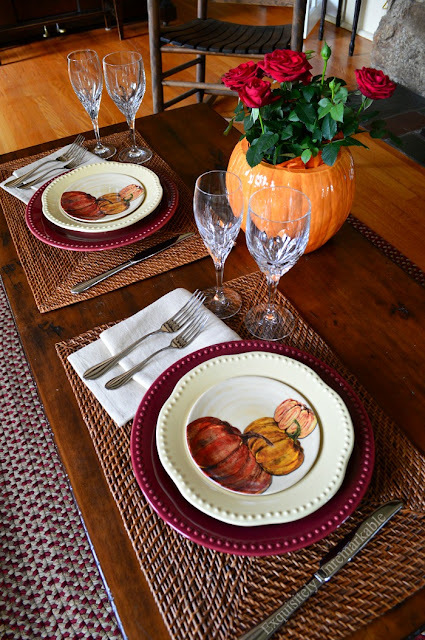 Those pumpkin plates are very cute and you have definitely set the mood! Perfectly lovely and absolutely charming in every way! Well done! No wonder you fell in love with your home with that gorgeous fireplace! And you've set the perfect table to enjoy it! 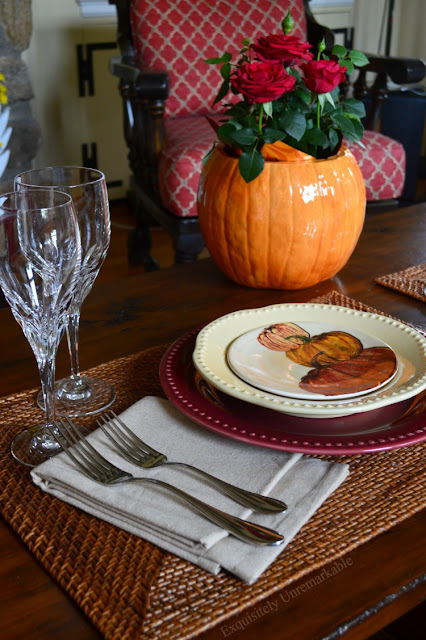 I really like the pumpkin plates and the stemware. Hope you enjoy your evening in this fantastic room! Its our anniversary this wknd and I've set a table in front of our fireplace too! This is beautiful and I love the pop of red in the table setting. 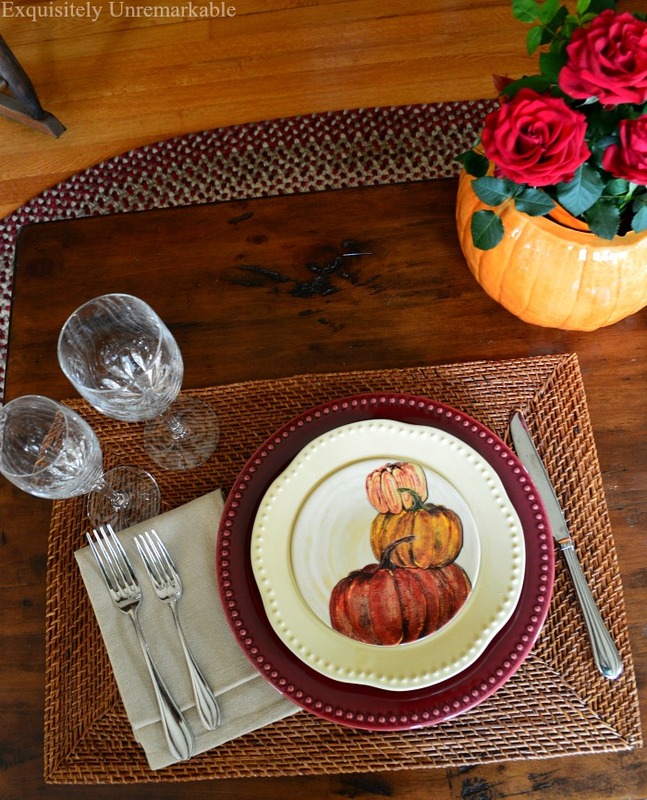 Fall tablescape is lovely because of the warm colors. That is the one thing I love about fall, Vanessa....all those glorious colors...and thanks! It is so cozy! Love those pumpkin dishes! Wow so cute. I love the fact you are using this beautiful setting for your meal. Lovely and romantic! Take good care. Thank you, Lynn. Those plates just make me smile! Kim, those beams and fireplace would have had my checkbook out that first day, too! Isn't it sweet how we feel at home so quickly in just the right place? I would feel at home in yours immediately. I love the pumpkin with red flowers! Not something I would have thought of, but they look fabulous together! So pretty! Thanks!! I am a red (with anything!) junkie, Kim! I'm glad you like it! Ahhhhhhhhhhhhhhhhhhh what more is there to say???? That room is absolutely lovely, you are blessed! Hi Kim, what a wonderful spot to dine in front of the fire. So cozy and inviting. Love the plates and the simple accents. I was looking back at photos recently and can see how less in decor I've scaled back from as well. You've created the perfect fall setting. Love your fireplace!! Have a nice weekend. What a cozy space you have created. I love it. Thank you, Lisa! I have to say, I do love it, too! those plates are so cute! I love your fireplace! What a beautiful setting for a dinner for two. 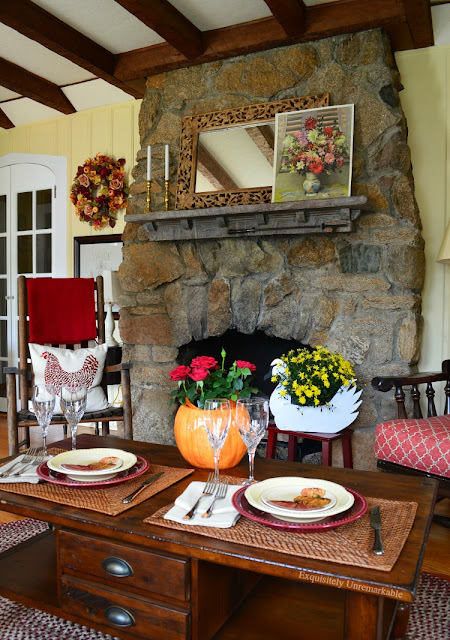 What a perfectly cozy spot for a romantic dinner, and those pumpkin plates are too cute! Hope you have a great weekend. Of course you had to say yes to this beautiful home and oh the fireplace! I loved the home in general, Jemma, but that room closed the deal for sure! :) Thank you for your sweet words! Those plates are SO cute! 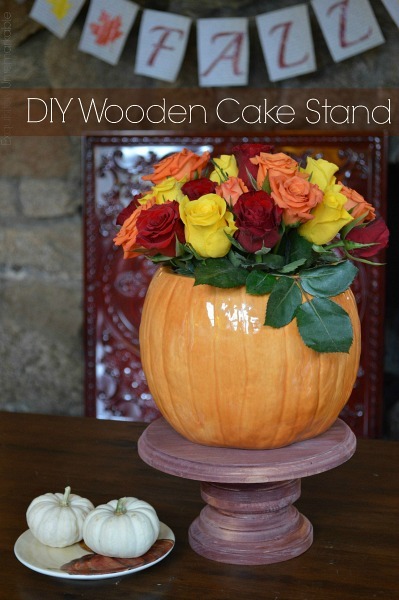 Love your pumpkin vase centerpiece, too! What a cozy place to eat! I can imagine sitting in that pretty room with the fire lit. How cozy to sit and eat and chat there. LOVE the dishes!! This is so cozy and warm... I love the colors! Your living room looks like something out of 'Big Sky Magazine'. It belongs in Montana, or Lake Tahoe, or the Adirondacks...or as my neighbor. Won't you be, won't you be, won't you be my neighbor?? ;). I don't blame you for writing a check the same day. Ceilings like that are hard to find in your neck of the woods! I love your cute pumpkin plates. As you said, 'too cute'. I love those Pottery Barn pumpkin plates too . . .
and a bit of red . . . Thanks Mary! I do share this room occasionally, but the kitchen usually takes center stage. We are always in the kitchen. Lots going on in there! I love the fireplace, easy to see why it was love at first sight for you! Very pretty and cozy Kim. Actually I thought those pumpkin plates had food on them at first. Never saw the pumpkin design until you pointed it out. I love rustic, so that fireplace is just perfect. I can see why y'all jumped at the house. I don't think that I'd ever want to get up from this spot! So cozy - just perfect! Your home is so cozy and rustic. I love that fireplace, OMG!!!! The older I get, the more I appreciate all things rustic, and I've been pinning a lot of pretty rustic homes and rooms lately. I'm pinning this post, too!!! Thank you so much! In the summer I tend to crave light and white spaces, but in the fall and winter, the fireplace and rich warm colors rule my world! :) And I’m with you…rustic pins all the way! I thought that pumpkin was real! Very nice and I am glad you had a wonderful evening. Haha…I know! It’s a very realistic pumpkin, isn’t it? It was thrift store find a few years ago…and one of my favorites! 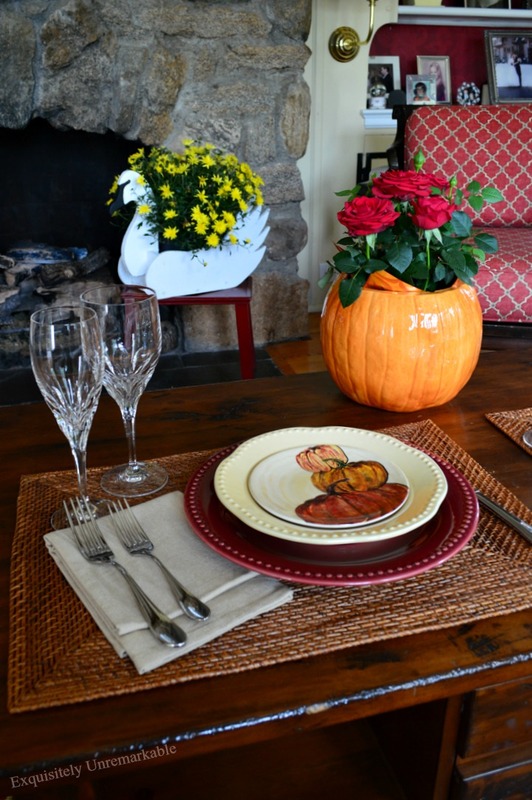 Those pumpkin plates are charming and your centrepiece is lovely! So cozy and warm. What a beautiful space to dine in. LOVE the dishes. Thanks again Kim for sharing you beautiful table setting at Cooking and Crafting with J & J. What a cozy spot to enjoy a meal by the fire! Love it. Those pumpkin plates are adorable, the fireplace is the centerpiece for sure, but my favorite part was that rocking chair. Cozy and comfy with the burgundy throw. So nice. I can completely see what that fireplace and those beams sealed the deal...what lovely features. And what a perfect setting to enjoy a cozy dinner with your sweetie. Thanks so much, Lynn. It really is a great room in fall! Thanks for the visit! It looks so cozy! I hope you enjoyed your date! Thanks so much, Cherryl! We did! You home is so pretty and comfy! Love the romantic table!